A good getaway sounds like a lot of fun. 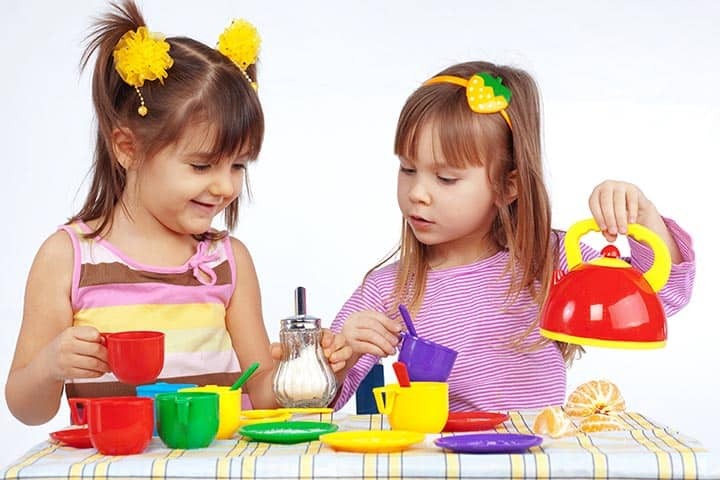 But when you are bringing small kids along, you will have to plan ahead and be prepared with the right kids’ gear. One question that keeps popping in many parents’ minds is on the type of stroller to get for travel. That is why we are here. Today, we have narrowed down the best travel strollers in 2018. Here you’ll find compact and lightweight models designed to take off the hassle of traveling with a baby. Why should you travel with a stroller? What kind of travel are you taking? Everyday strollers are bulky, but a travel stroller should be smaller and lightweight. If you are looking forward to traveling light, a small-sized stroller which folds compactly will do the trick. This way, it can fit in the trunk of your car or on the overhead compartment on an airplane. Light and compact strollers are easy to maneuver since they are easy to check in as luggage on flights and even go through doors. How easy will it be to fold down the stroller? You may fold a stroller multiple times on a trip, and if it is not straightforward, it can work your nerves each time. The convenience of quick folding is important when you are traveling alone or have to watch several kids. Depending on where you are traveling, you may want to have an idea of the roads and places you’ll be visiting. Rubber-coated plastic wheels are ideal if you are traveling across the country, but when traveling abroad in places like Europe, you should expect lots of stairs where plastic wheels are likely to come off. Pneumatic wheels that are filled with air or foam filled wheels are robust and can handle rough terrain. Shocks/suspension systems provide a less bumpy ride. They make navigation in rural areas easier so you won’t be lifting the stroller every few meters. Here we are talking about things like a reclining seat. Some travel strollers can recline while others cannot. A reclining stroller will come in handy during nap time as they offer a comfortable sleeping position. It will allow you to stay out longer when traveling with a kid who naps. Strollers that recline can be bulkier, but it is an additional feature that is really necessary. Other features include adjustable footrests, larger canopies which are essential in sunny climates, and even a storage basket for keeping essentials at hand. Why we like it: Our best overall is an ideal travel stroller for babies from their first months. Summer Infant 3D Lite covers all the aspects of a high-quality yet cheap travel stroller. How would you like a travel stroller that is lightweight and durable at the same time? Well, Summer 3D Lite have done their homework on bringing an all-around system. This particular stroller has an aluminum construction. It is a lightweight frame but very sturdy. In fact, this stroller can accommodate a weight of up to 50 lbs. This stroller provides a near flat recline where you can rest a napping baby. It allows you to stay out on parks and enjoy the outdoors knowing your young one is comfortably sleeping. With the 5-point harness, your baby will always be safe as it is better than a 3-point or even an X-shape, especially for small babies. The Summer 3D Lite can fold in three easy steps. It’s not the best fold system we have seen, but at least you won’t be needing help when you have not brought your partner. Also, it comes with an adjustable canopy that performs great in the sun. You can travel in hot climates, and the baby will not suffer any sunburn since it is rated to block 99.9% of UVB and UVA rays. Summer 3D Lite is for the parents who are always on the go. 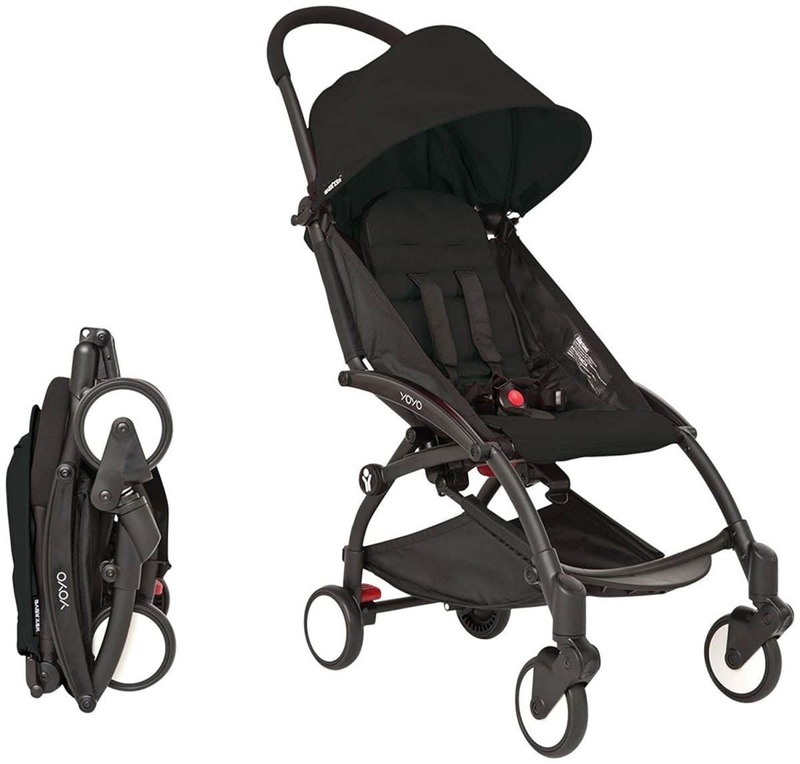 It is one of the lightest strollers that provide ample storage and folds compactly during travel. Why we like it: It’s the most compact travel stroller on our list favoring every parent who flies constantly. gb Pockit brings us a revolutionary product. It is the lightest and most compact stroller that will take you from place to place without a hitch. Talk of a stroller that is as light as 9.5 pounds and can fold down to 13.8 inches. It is dependable for air travel since it can easily fit onto a plane’s overhead compartment. This model uses a two-step fold system which means you can be up and going in seconds. It can fit in an oversized travel bag since it does not have a strap. However, the small size allows for squeezing in a few more stuff in the trunk especially when taking road trips. The frame of this model is built from premium materials. 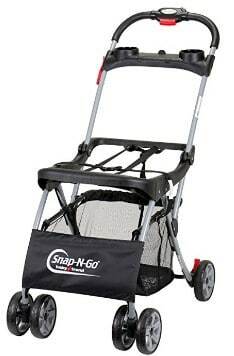 It has a capacity of 55lbs which allows for a wide age group to use this stroller. It can hold 11lbs of gear in the bottom basket making it even more practical for day trips. With the adjustable harness system, your child will always be secured on the seat. The comfort pads provide a cozy fit since they can be tightened or loosened accordingly. Not to mention, you will be dealing with an adjustable frame so you won’t go knocking your knees as you walk. Just adjust it to your torso, and you are in for an enjoyable stress-free walk. gb has brought in innovative features in an utterly affordable model. You will be happy with the design alongside the many functional features that make air travel a breeze. Why we like it: A perfect accessory for travel. It’s lightweight, portable, and converts into a travel system for small babies. Going on trips just became easier if you want a versatile travel stroller. The Graco Breaze uses a sturdy frame which can carry infants and kids weighing up to 50lbs. It has a one-hand fold mechanism meaning you will be able to store it compactly when you are short on space in the trunk. With this model, you can take a car seat and attach it to the seat for a smooth transition into a stroller. It makes it easy to take the youngest member of your family on long trips especially if they are not of age to sit up properly. And if your baby is over six months old, they will enjoy the view from the high seat. The seat can also recline to provide different sitting or napping positions. It becomes a necessary item when you have a kid that cannot walk long distances or when it’s their nap time, and you have not yet gone back to the hotel. This unit is highly maneuverable seeing that it comes with front-swivel wheels. They allow you to make swift turns, and you can even lock them when the ground is uneven. You will be happy that they include a suspension system so that your baby will not feel every bump in the road. The canopy has UV 50 protection to help keep them safe from sunburns when you visit a hot climate country. It includes a visor which gives maximum coverage for your young tot. Graco Breaze gives you the confidence to take a baby for long trips. It is foldable, it can recline, and the wheel system can face up to rough roads. With the padded handlebars, you will always feel comfortable no matter how far you have to push the stroller during your adventure. Why we like it: Suitable for both short and extended car trips. 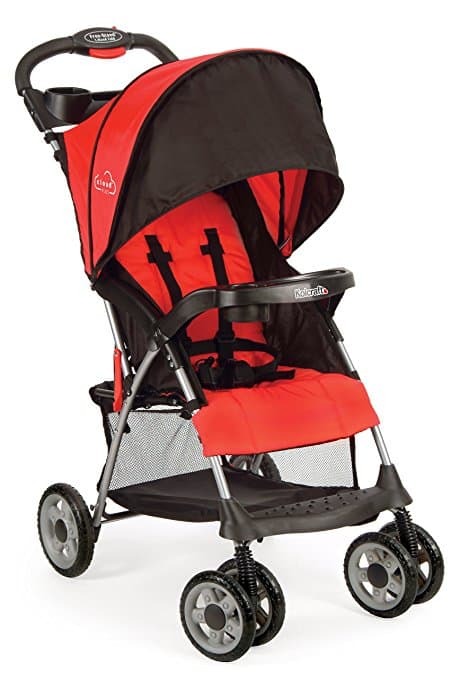 It folds more compactly than other strollers in its category, but the price tag is very reasonable. Kolcraft Cloud Plus is a model that represents the mum or dad who likes taking road trips. It also follows a lightweight design, and it can still accommodate kids up to 50 lbs. The one hand folding mechanism is easy to employ. It gives you a self-standing stroller for vacations. 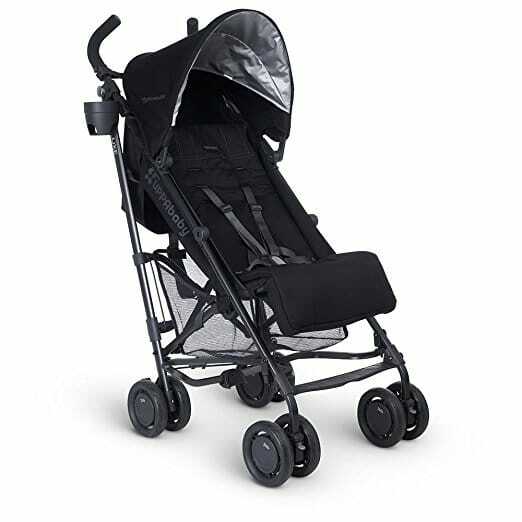 This stroller is complemented by a wide canopy which includes a peek-a-boo window. Now, you will always know how your kid is positioned in the seat. What’s more, it has a seat which reclines to a nice level for the baby’s sleeping time. You may think that a storage basket adds to the weight of the stroller. But the idea of taking an extra bag when just taking a walk is not ideal. With this stroller, you will be able to store diapers, wipes, and even toys to keep your bambino entertained. With a one-hold system and a light frame, you have a dependable stroller for an all-day trip. It is small and easy to navigate meaning you will quickly get through entrances. For the parent who wants a fun and smooth time in the outdoors, Kolcraft Cloud Plus got your back. Why we like it: It can fit into a travel bag. This portable stroller takes minimal space in your car or on a plane’s overhead carrier. If you are a family that travels a lot, then you know that traveling light is crucial. With a stroller that goes into a travel case, it is apparent how effortless it will be to stow the stroller away or check it in during flights. The Jovial model is safe and comfortable for newborn babies up to three years old. It has a wide 5-point harness with padded shoulders to keep your kid safe but still very cozy. We like that the seat can be laid flat in a bassinet style for infants or propped up for kids that can sit upright. This stroller locks the wheels by using a brake system. It gives you some peace of mind when in a park or shopping mall. You have one-hand steering meaning your other hand can tend to the baby without losing maneuverability of the stroller. This is a compact stroller to cater to the need of the family with an active lifestyle. It folds right up, the seat can recline to a flat position, and it can fit in a travel bag. If you love flying or taking road trips across the country, even a newborn will not give you an excuse to stay at home. Why we like it: The stroller reclines flat for babies aged three months. It’s a high-performance stroller for all terrain and perfect for sunny days. With a safe and comfortable reclining seat, the UPPAbaby G-LUXE Stroller gives you peace of mind when bringing an infant to your travels. It allows the seat to recline fully in a bassinet style such that you can get your baby down and watch them as they sleep. It comes with a heavily padded seat which provides a comfy sleeping place. It is complemented by an extendable SPF 50 sunshade which offers protection from the sun and even the rain if you are caught out on a rainy day. You will like that it has a foot brake which makes navigation in crowded places much easier. This model boasts a construction from lightweight aluminum. 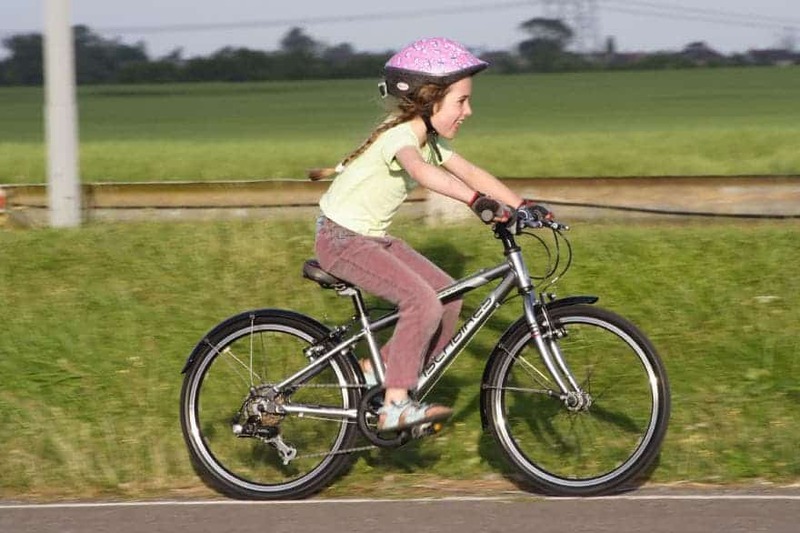 It provides the ideal weight capacity of up to 55 pounds so that even toddlers can ride without any problems. The stroller has a hand-level trigger which allows compact folding, and with the strap, you will be able to check it in many airports. 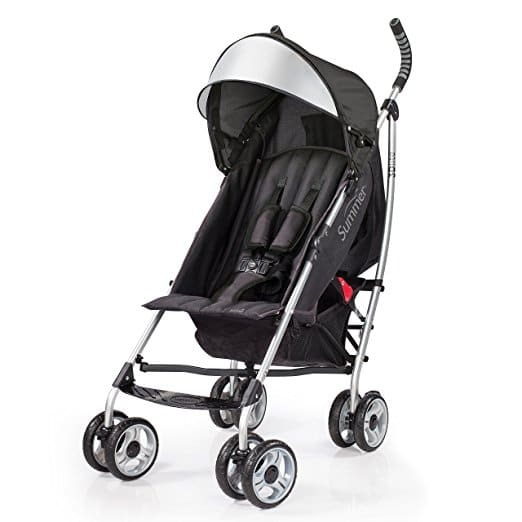 UPPABaby G-LUXE comes with 5-75-inch wheels which can be of use in city walks. You will be able to travel to great destinations and explore new cultures while your child rests and enjoys the ride. It has a parents’ cup holder and a convenient bottom basket for storage. From the high-quality to the extendable canopy and the fact that it can fold using one hand, UPPAbaby G-LUXE ensures you will have a memorable experience on your trip. Why we like it: Plenty of bells and whistles to make traveling with twins less of a hassle. This stroller is not only easy to use, but it also has a nice quality. Every parent who has twins craves to own a lightweight double stroller. Well, ZOE XL2 makes it all possible. This side-by-side stroller offers more convenience than you would ever get with other twin strollers. First, it weighs only 16 pounds which is close to what single strollers weigh. Secondly, it has a double-wheel system which makes maneuverability a breeze. This stroller can fold to a minimalistic size that can comfortably fit in the trunk. You’ll love that you just have to pull on the straps of each seat and the stroller collapses and then it locks itself. Luckily, you don’t have to support it once it is folded because the wheels can provide enough support for the frames once you face them in the right direction. This stroller has reclining seats. If your kids take a nap now and then, you can enjoy the convenience it brings when you are in the zoo, and one baby wants to sleep while the other wants to stay longer. It also comes with 5-point harnesses which provide the ideal safety. You have a model that includes dual storage pouches to keep the important hands-on stuff like your phone and car keys. You will also be supplied with two cup holders so you can enjoy a cold drink while watching the sunset on a beach somewhere across the country. When you have two kids, you will want the smoothest time during your travels. ZOE XL2 is incredible in that it has excellent features including a large weight capacity for older kids, extra storage space, individual 4-panel canopies, and a big storage basket underneath the seats. Babies spend most of their early life sleeping. And if you travel a lot, it means they can get disturbed at every touch because of the new surroundings. To avoid all that, Baby Trend has designed a popular Snap and Go frame where you just need to transfer the infant car seat into the frame, and it transforms into a stroller instantly. This model can also accept other car seats from other famous brands like Chicco, Evenflo Embrace, Graco Snugride, etc. It gives you the convenience of never having to wake the baby to transfer them to a stroller. You can watch the baby and interact with them since the seat will install to face your direction. A huge storage basket is included which can accommodate large items. This includes things like toys, a cover, diaper, a change of clothes for the baby and so on. We also like that you can store two drinks quickly and safely. It may look like just a frame, but when you are moving from place to place, it will make a lot of sense. Many mothers swear by it mainly for day trips where you can get out of the vehicle several times. Why we like it: It’s better than a standard size stroller. Chicco Capri has thoughtful features to make traveling a stress-free pastime. 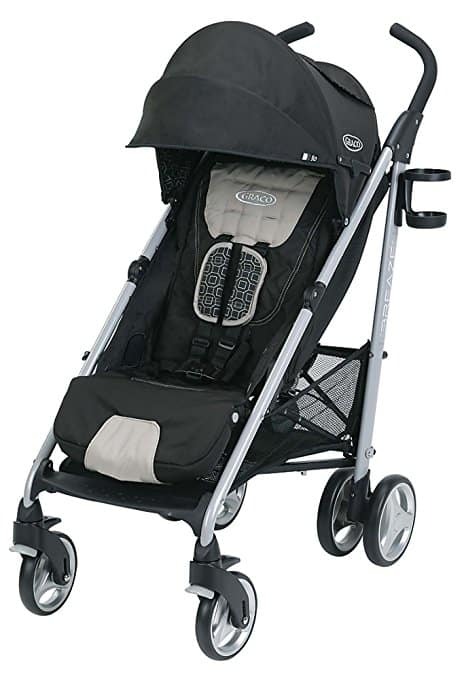 The Chicco Capri model is an ideal pick for traveling in any weather. It is available in two colors with the Tangerine here popular for its travel-like brightness. This stroller provides comfort when carrying and pushing your baby since it weighs only 11 pounds. It is in the class of the gb Pockit since it will fold into a small footprint ideal for taking on flights. 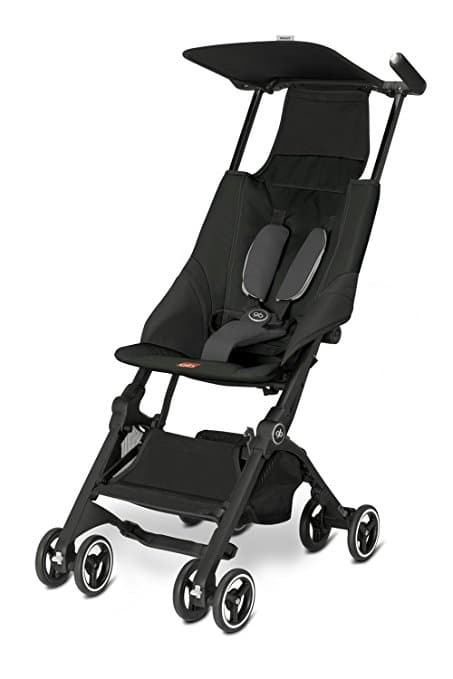 Chicco Capri is designed using a corrosion-resistant aluminum body. This means it can face up to the elements for the years you will be using it in the outdoors. We love that it comes with a removable canopy which will protect your baby from the wind, rain, and the sun. It also has a padded 5 point harness for a secure fit. This model is comfortable to use with babies from the age of six months. It can recline in two positions offering a straight up position when your baby is sitting and a near flat position for sleeping. With the wide rear dual wheels and front suspension, you are assured of a smooth ride even if the paths take you to the backcountry. Chicco Capri is a reliable brand, and this model tells it all. It includes the necessary travel accessories which make packing for a trip less of a headache. Why we like it: It’s a grab and go design. The Vive stroller provides seamless attachment of the baby to the stroller while they are still in the car seat. Are you taking a family vacation or a spontaneous adventure? The Evenflo Vive Travel System is ready when you are. This model features a slim and foldable footprint to facilitate care and on foot travel. You can easily transfer a car seat onto the frame without worrying about adapters. The Embrace car seat provides an extended weight for babies since it can carry babies as small as 4 pounds up to 35 pounds. You can also skip the car seat and just use the Vive stroller with its padded seat for older babies from 6 months old. This model is slim meaning it will easily go through doors. It also features multiple reclining positions ideal to carry your baby in the most comfortable position. Older babies will enjoy sitting upright and explore the outdoors together with you. A wide canopy will help shield your baby from the elements as it is protective and sturdy to withstand winds. You will like the harness as it is 3-5 point system allowing you to choose the best secure fit. This a versatile stroller that will not only be useful for an infant but it provides for growing with the baby. It is slim, foldable, and provides a double grip for fast navigation. Isolated complaint about the car seat not locking into stroller even after producing the click sound that indicates it has locked effectively. Traveling with a baby is an overwhelming decision. But it will only be stressful when you don’t take the right baby gear. When you have lots of luggage to bring, a stroller will help you know where your kid is especially if they can walk and you can easily keep sight of them. And when you are just taking a walk around the hotel, your hands will be free to take pictures, carry drinks, use the phone, etc. instead of trying to balance your baby on the hands while you do other stuff. When you have a bad back or your child is particularly heavy, a stroller will help you get them around with ease. You don’t want a tired child throwing tantrums in the museum or train station when they could be resting on a stroller. These are multiple piece sets which include a stroller and a car seat. They allow you to snap in the car seat when traveling with an infant and get to use it when the baby gets old enough to sit up. The infant car seat attaches seamlessly to the stroller allowing you to take the baby in and out of the car without waking them up. These strollers can be more costly and bulkier than other travel strollers. These are the most popular travel strollers. They are easily identified by the large canopy that serves to protect the baby from the outside elements, and the umbrella-type handles. These strollers fold compactly and easily fit in the trunk. These strollers are also lightweight with most of them weighing around 12 pounds. 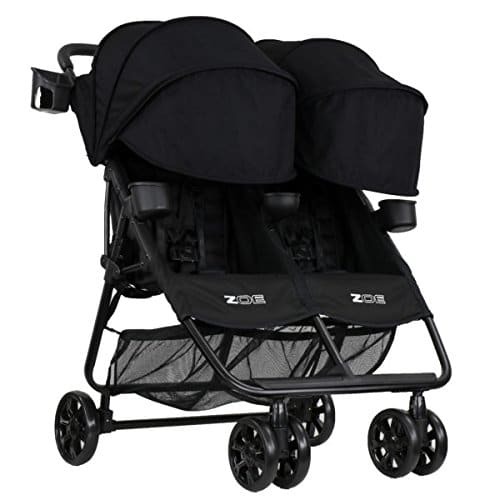 Because of their design, these strollers are ideal for babies aged six months to 3 years. These are designed to attach a car seat. They have storage underneath with all the other features of a travel stroller except for lacking a seat. These strollers offer parents the ability to carry their babies in the ideal reclined position provided by car seats. They are a nice option for travel since the baby will face your direction and you can interact with them. 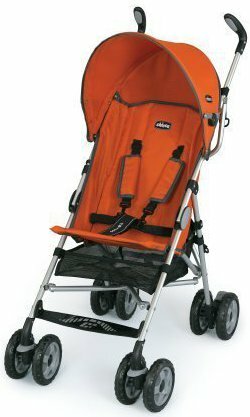 These strollers tend to be larger than umbrella strollers, but they have regular handles and more features for travel. They will have features like suspension systems, swivel and pneumatic wheels, folding systems, and reclining seats. They come with parent accessories like drink holders and phone compartments. Your child will be sitting for hours on the stroller seat. You will want them to be fully rested on a stroller that uses a well-padded seat. The frame should also be robust and corrosion resistant since you will want the stroller to grow with the baby. You should look for an easy to care fabric where you can either wipe it down or remove it for hand washing. Safety is always a vital factor as it contributes to the comfort for you and your child. Look for adequate locks and brakes for added stability. Some models will have a foot brake and a lock while others will have a lock only. Also, don’t forget to look at the general side protection to protect your kid from slipping through the sides. To achieve comfort, you’ll want to look for padded seats, padded handles, adjustable handlebars, and even cup holders. Pushing a stroller that is too short can leave with an achy back while one that is too tall is difficult to handle. The best travel stroller will have telescopic handles or be the ideal height for most people’s torso. It can be hard to identify the right one, but the gb Pockit seems to have achieved a balance for everyone to use their stroller. Of course, you will want the stroller to be suited to your baby’s age. You don’t want to use a model that does not have adequate support for your 2-year old since it has a maximum load for a 1-year old kid. You’ll want to check the specifications even as you factor in the other features. Another thing to bear in mind is that if you are traveling with a newborn or infant, the stroller will need to accommodate a small baby. This goes for such strollers that can adapt a car seat like the Baby Trend Snap and Go or Evenflo Vive Travel System. Here’s a video on how to assemble the Baby Trend Snap and Go. 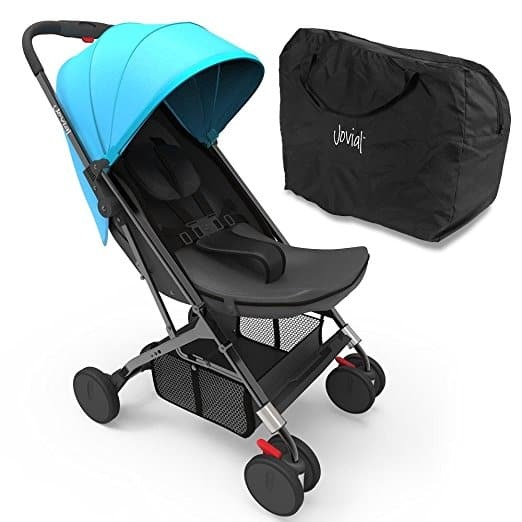 If you are going on a road trip, size may not be a big restriction, since you can find the first stroller with a foldable design and store it in the trunk. But for flights, you will want the smallest possible stroller that can easily be checked on the airplane. 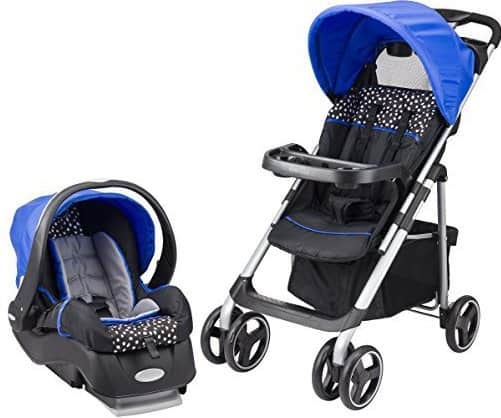 Travel strollers are priced according to their size, quality, and features. Small and lightweight models are common and lightweight but with the included features like suspension wheels, ease of folding, aluminum frames, adaptability to infant car seats and the ability to change where the baby is facing make the prices vary sharply. You will need to look at the most critical features and those that you can live without. This can be like the fashionable style or a particular color that costs more than another. Having the ideal travel stroller takes away the anxiety of traveling with a baby. Even the mother who loves using carriers will appreciate the convenience brought about by being able to rest the baby in a much more comfortable position other than their arms. In this list, we have given you a detailed overview of some of the popular travel strollers. With the different categories, we believe it’s now going to be an easy job picking a stroller for your next trip. If you want a travel system, a cheap model, or an ultralight travel stroller, this list is all you need.